It’s the final episode of EE Leaders Season 1! (Don’t worry, Season 2 is coming up.) It’s been a great first season, and as Pastor Daniel says, “It’s all been by God’s grace.” If you haven’t heard all the episodes, they are available now to watch or listen to and share with your friends in ministry (see link below). 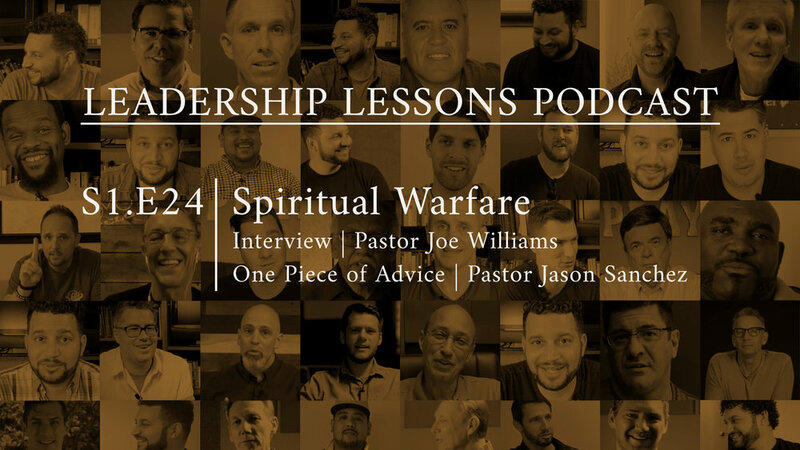 In this episode, Pastor Daniel talks in depth with his dad, Pastor Joe Williams, Calvary Chapel of Tacoma (Washington) about spiritual warfare, what it is and how it affects the daily life of every Christian on earth. What does the Bible say about demonic activity? Every person who lives for God is going to face opposition. But Satan is a defeated foe. God has given us the tools to fight to defeat him. As Christians, we need to learn to use the weapons of spiritual warfare that God has given us. Knowing the word of God, spending time in prayer with Him, and gathering together with other believers to stand united against the enemy. Pastor Joe gives us a great encouragement to walk in the power of the name of Jesus Christ. You’ll be blessed! In this week’s One Piece of Advice, Jason Sanchez, Director of House of Blessing Orphanage in Bachiniva, Mexico shares his advice about the importance of humility.